This article will present a walkthrough on the painting of a 54mm scale Napoleonic Dragoon using acrylics. 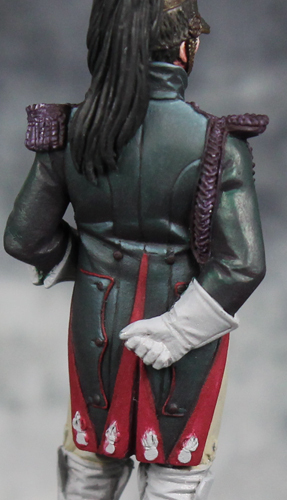 The specific figure is Pegaso Models’ Imperial Guard, Empress’ Dragoons Officer, 1806-15. 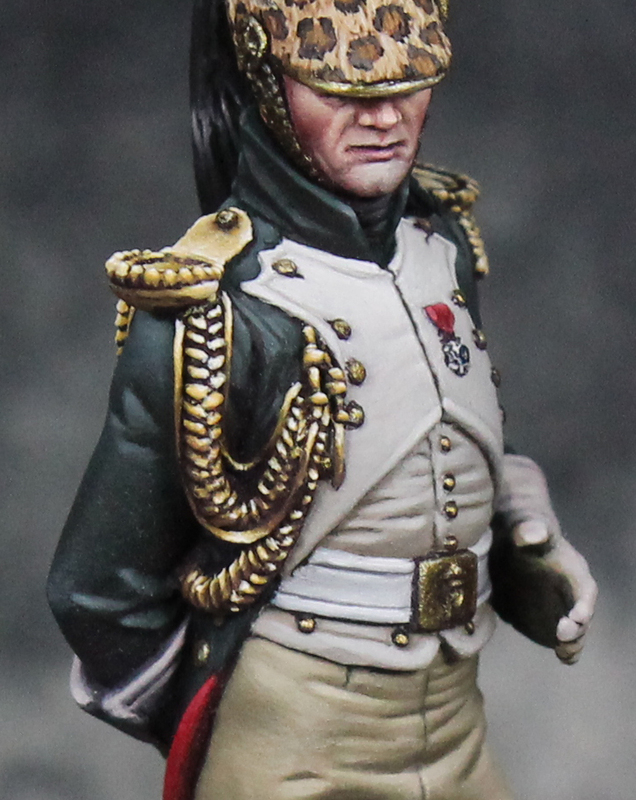 Napoleonic figures are among my favourite historical subjects to paint. Of all the different eras, they have some of the most colourful and detailed uniforms. 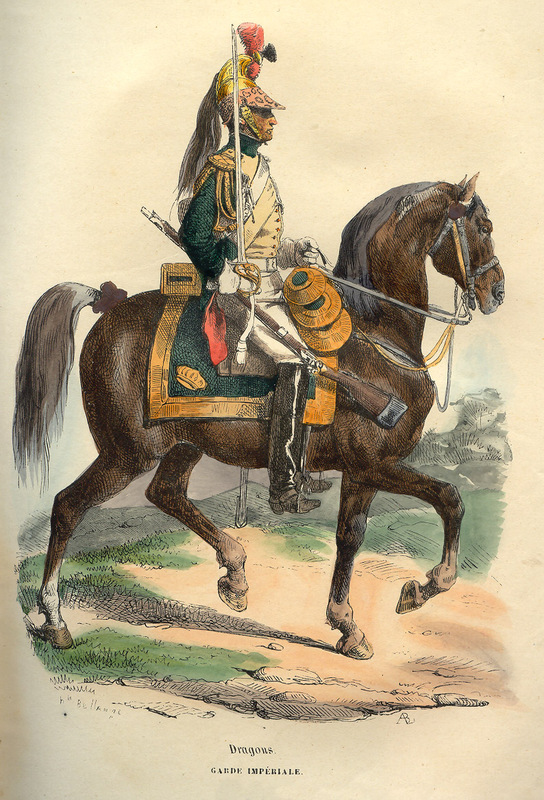 Of the various Napoleonic units, the Dragoons may not be the most colorful, but there is something about their slick uniforms that draws me to that subject. The Empress’ Dragoons, also known as the Dragoons of the Imperial Guard, were formed by Napoleon in 1806. The nickname Empress’ Dragoons was in honour of Empress Josephine. To create them, Napoleon reorganised the cavalry of the Imperial Guard and created within it a regiment of dragoon guards. 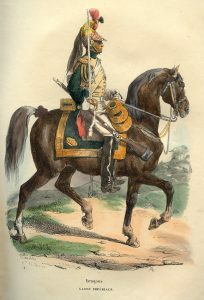 Though the original class of soldiers known as dragoons were mounted infantry, by this time dragoons had taken on a traditional cavalry role in warfare. However, they were more of a light cavalry than say the heavier armoured cuirassiers. Because the Empress’ Dragoons were formed from the Imperial Guard, their uniforms were the same as those of the Guard’s horse grenadiers. The exceptions were the coat being green instead of blue and a copper helmet (with black mane and a red plume). Their Guard origins also sets them apart from the regular dragoon regiments within the French cavalry. So reference information on the uniforms and colours for Napoleonic dragoons does not necessarily carry over to the Empress’ Dragoons (and vice versa). The internet and reference books are great resources for this sort of thing, but you have to make sure you’re looking at the right subject! One of my bad habits is jumping into painting the figure before really giving much thought to how the final scene will look. 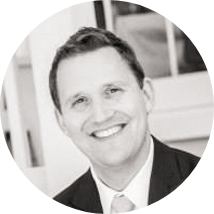 The base and groundwork can be an afterthought. However, really great figures work in concert with their scene. One of my hobby resolutions has been to put more effort into the overall scene and have an idea where I want to go before I even start the figure. To this end, I decided to take this piece a step further and actually build the base before I even started on the figure! While I may not do this with every piece, it’s a habit I’d like to develop. In this case, I’d actually had a base like this in mind for some time. A couple years ago I’d purchased some etched brass parts from a UK company called ScaleLink. Their focus is stuff for railroads, but a number of pieces are in scales that work well for our miniatures. As I was looking through their catalogue I saw this great set of etched brass Chateau gates in 1:32 scale (perfect for 54mm figures). I knew eventually I’d find a good Napoleonic piece to pair them with. When I decided to paint this dragoon, he seemed like an ideal choice. Soldiers in the Napoleonic era (and others) wore different outfits for different occasions. 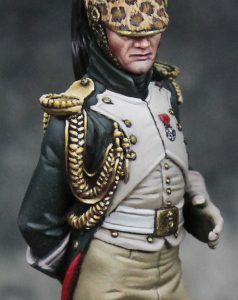 The last Napoleonic dragoon I painted was in campaign gear. So it made sense to put him on the battlefield or in camp. This dragoon is in his dress uniform. So I wanted to put him in a setting that fit his outfit. Standing outside the gates of a chateau seemed reasonable. Perhaps he’s returned home. Perhaps he’s been invited there for a social event. Who knows. The point is it’s a plausible setting for him and the viewer can come up with their own story. To create the base, I built a column to attach the gate to using juweela bricks. I had some small etched brass name plates, so I put one of those on the column as an address plate for the chateau. The ground got a layer of sand and the figure was then positioned slightly off center, in front of the gate. Getting to the actual painting of the Napoleonic Dragoon, I began by priming the figure in light grey and then base coated the main sections. I like to start my painting with the face, but need to make sure the areas adjacent to the face are base coated to help avoid mishaps later one. I used my usual mix for skin on the dragoon. I began with a base of Reaper’s Rosy Skin Shadow. I then mixed in some reddish browns (Chestnut Brown and Mahogany Brown) to create the darker shadows. To highlight I gradually mixed Fair Skin into the Rosy Shadow followed by Fair Highlight. The highlights were focused on the nose, top of the cheeks, and the chin. The darkest shadows were placed around the eyes and on the sides of the cheeks. You can imagine a light shining directly on the face. The front is more lit up than the sides or back. I tried to use the biggest shadows for the main figures. Then, finer details like the lines around the mouth have more subdued shadows. The final step in painting the face was applying several layers of different glazes. I start with a red glaze (using inks from Scale75 but very watered down) and apply it to the cheeks. I start about a third of the way down the cheeks and then continue to push the paint down and back into the deepest part of the cheek. I build the effect over 4-5 layers. It should be subtle, but still noticeable. I also apply a little of the red glaze to the tip of the nose and the bottom the ears. I use maybe 3 layers here so the effect is even lighter. I then use a blue glaze and apply it to the lower part of the jaw to imply some stubble. 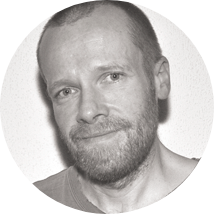 In this case I limited that to about 3 layers as I did not want a strong stubble effect. I figure he’s an officer and probably well groomed. So I just want to hint at it. 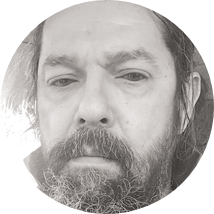 Below is an image of the completed face. If you would like to see a step by step breakdown of how I paint faces, you can find that in this previous tutorial. 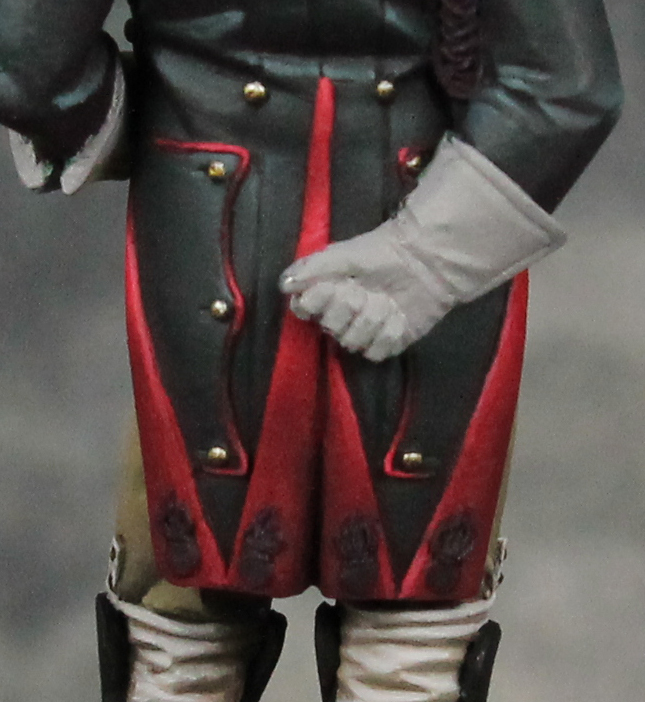 Now we get into my favourite part of the Napoleonic figures: painting the uniform. It’s good to check out some references for the Napoleonic dragoons or indeed any other historical figure. There are plenty of drawings showing Napoleon uniforms online. You can also find pictures from museums and photos of re-enactors to help with the colours. If you plan on doing a lot of Napoleonic figures, it’s worth investing in some reference books though. I’ve got a collection of ones from Osprey which are very convenient to have on hand. Often you will have the option to use a number of different colour schemes. Different regiments typically had unique colours on their uniforms (which is why reference books can be helpful to figure all of that out!). For the Empress’ Dragoons however, the colours were pretty much set. 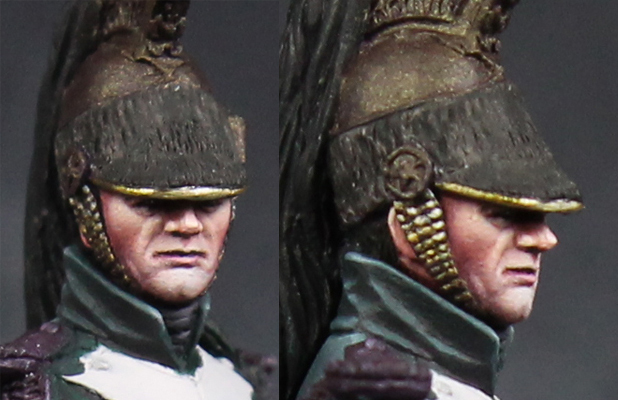 But, even if you’re painting a different Napoleonic subject, many of the same challenges will pop up. So I think a number of the tips and tricks I describe below will still be useful. A number of different Napoleonic uniforms make use of dark greens or dark blues. These colours can be tough to paint. As you highlight them, it’s very easy for that dark green coat to start to look more like a medium green or even a light green coat. Still, you need to highlight or else the figure looks flat. So what do you do? Painting of dark green on coat (sleeves just base coated, only center completed). Well, one solution I’ve found is to use greys to highlight. This lightens the green (or blue, works there too) while also desaturating the color. Visually this helps maintain the impression that the overall colour is dark green. 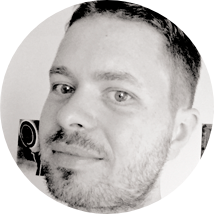 The other trick is to limit the amount of area where you place the highlights. Keep the midtone dark and then drastically reduce the spaces where you apply the highlight shades. The results of this can be seen on the right (centre of coat only, the sleeves are just base coated). Highlights are placed on the top of the shoulders/back, on the top of folds, and on some edges. But overall they are very limited in area. You can also see that the green becomes very pale in the highlighted areas. The result maintains the dark green feel of the coat. To paint this coat, I began with a base coat of Badger Minitaire’s Dark Green and mixed in a little bit of Reaper’s Burgundy Wine (a very dark purple) to darken the green further (around 2 parts dark green to 1 part dark purple). The shadows were create by mixing in even more Burgundy Wine. This dark purple makes a nice contrast with the green. To highlight I gradually added in Reaper’s Rainy Grey (a medium to light grey). You can experiment and see how the effect changes when you use a darker or a lighter grey to highlight. 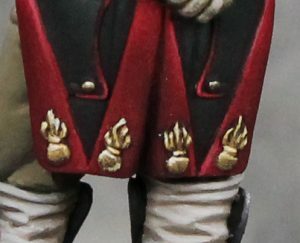 The turnbacks on the tail of the coat and some of the detailed for the dragoon was in red (note that for the regular dragoons this color varied by regiment). I began by basing the red with Reaper’s Violet Red. To shade I mixed in the same Burgundy Wine as I’d used with the green. To highlight I used Fire Red and then just a touch of Fair Skin on the top most highlights. There are a number of white or off white components on the dragoon’s uniform. In order to help differentiate the different materials, I made use of several different mixes. For the shirt and the turnbacks on the front of the coat I used Reaper’s Bone Shadow, Weathered Stone, Leather White, and Pure White. This is a mix I like using for cloth and it has more of a natural sort of feel to it. I intentionally kept the shirt darker in comparison to the white on the coats. For the shirt I used Weathered Stone for the midtone and never went lighter than Leather White for the highlights. On the coat the midtone was closer to a 50/50 mix of Weathered Stone and Leather White and the top highlights were indeed pure white. For the belt around his waist, I used Misty Grey and Pure White. As you can see, all three are similar and yet still look distinct. For the pants I could have used an off-white as well, but went with a khaki to further distinguish them from the other whites on the figure. I started with Reaper’s Khaki triad (Khaki Shadow, Terran Khaki, and Khaki Highlight), but then added in Blackened Brown for the deepest shadows and Weathered Stone for the top highlights. The triads from Reaper are a nice place to begin, but their contrast range is not that extreme. 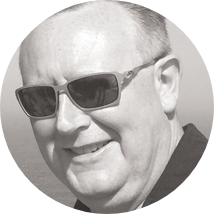 Supplementing them with additional shadow and/or highlight tones creates a more dynamic end result. When painting the pants, or really any cloth, pay particular attention to the theory of zenithal lighting. There are a lot of rounded folds here and at different angles. Surfaces pointing up are lighter and surfaces pointing down are darker. Simply dry brushing and catching raised areas will not produce realistic results. You can see from the example image on the right that a lot of care has been taken to properly place the highlights and the shadows. Example dragoon helmet for reference. Having finished the bulk of the uniform, I turned my attention to his helmet. From my references I saw that this should be a yellow copper for the metallic portions with an imitation panther fur ‘turban’. The crest on top should be a black horsehair mane and the plume should be in red. As always, it’s helpful to check out some references. To the left is a similar dragoon helmet, though with a different plume colour so not for the Empress’ Dragoons. Still, close enough to be helpful. For the metallic portions of the helmet I relied on Scale75’s Metal ‘n Alchemy paints. From their gold set, I began with Necro Gold mixed 50/50 with Reaper’s Burgundy Wine. This helps to both darken and reduce the reflectiveness of the shadows, keeping them dark no matter the room lighting. To that, I gradually mixed in Elven Gold before finally adding Citrine Alchemy for the Highlights. 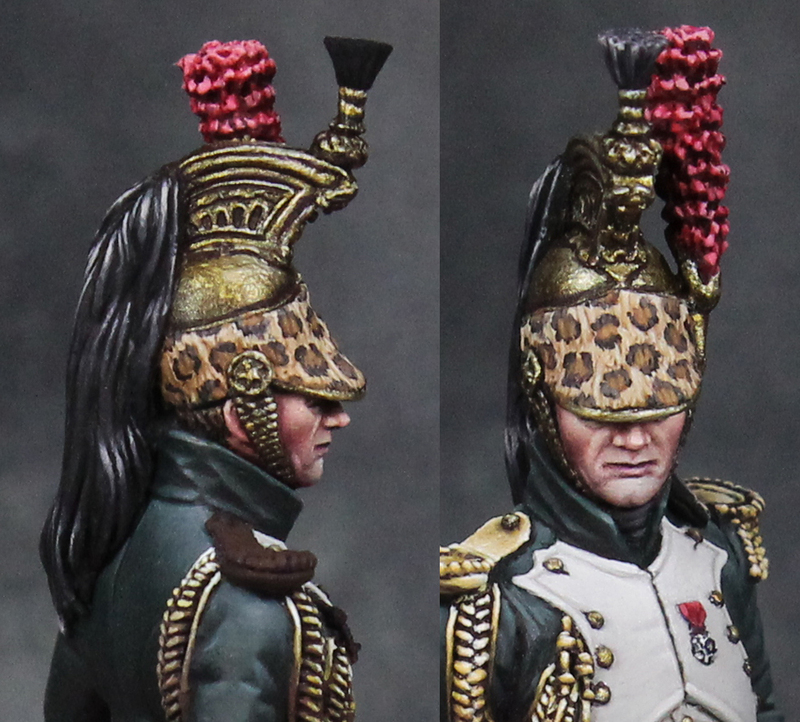 The next challenge for my Napoleonic Dragoon was tackling that panther fur pattern for the turban. I consulted a number of references, including the one just shown. I wanted to mimic the colour for the panther and also the pattern. It’s worth noting that the size of the spots can vary significantly and the same goes for their shape. So using references is key to getting a realistic result (unless you’re already a panther expert!). To paint mine I began with the background colour. I used Reaper’s Bronzed Shadow, Bronzed Skin, a 50/50 mix of Bronzed Highlight and Khaki Highlight, and finally a bit of Linen White. This was applied using parallel downward strokes to help convey the texture of the fur as well. On top of that I put in the spots. I first did the black bits (using Black, Dusky Skin Shadow, Dusky Skin, and Dusky Skin Highlight). From the references I saw these were not pure circles. Rather that could be shaped like a C and broken up into two or three sections at times. Finally, I did the darker orange insides for the spots. Here I used a 50/50 mix of Bronzed Shadow and Muddy Brown and then highlighted that with Bronzed Skin. The crest for the helmet was painted in the same manner as the boots (which will be covered in the following section). The plume was done using the same red as the turnbacks on the tail of the coats (as described earlier). For the boots I wanted to paint a shiny black leather. While this can be attempted using gloss paints or a gloss finish, the results of those approaches just never satisfied me. So I decided to paint the boots like NMM instead. The details of this approach, along with step by step pictures, were made into their own tutorial. You can find all the details for that part of the piece here. The final piece of the Napoleonic Dragoon uniform to tackle were the military braid and lace details. 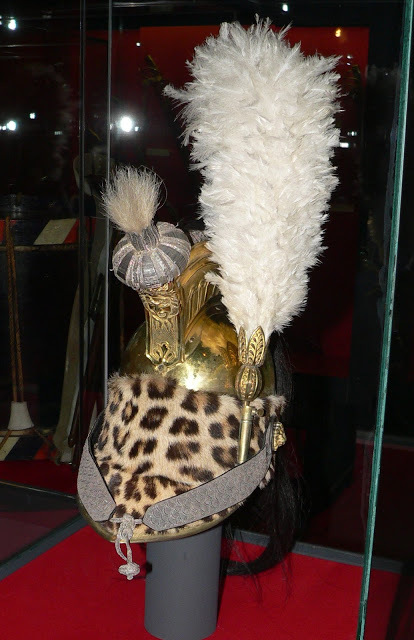 For the regular Empress’ Dragoons, this would be an orange colour however, for the officers it was gold lace. Painting of gold lace (or other metallic lace) is a bit of a conundrum. In earlier eras this was made from pure gold yet, from the 15th century, gold lace was actually a combination of metal and textile threads. So using metallic and giving it that finish does not seem quite right, but a matte finish doesn’t seem right either. On this figure I decided to try treating it a bit more like NMM (though a toned down version of it). The lace sections were base coated with Burgundy Wine. From there I worked in Muddy Brown, Palomino Gold, Buckskin Pale, and finally Linen White. I tried to work in large contrast changes over small areas to imply the reflective nature of the material. I also picked out edges with highlights when I could. In addition to the braid around his arm and the epaulettes, the same colors were used on the details at the bottom of the coat tails. One could question the use of both NMM and TMM on the same figure but, since they are being used for different materials, I did not see a problem with that. I feel like my approach to the metallic lace was more successful in some spots than others, but the attempt was an enlightening experience and I hope to apply it again (but better) on the next Napoleonic I take on. The base seems simple, after all it’s just dirt, a column, and a gate. But I wanted to paint it to a level consistent with the rest of the figure. The most time consuming part was the column. 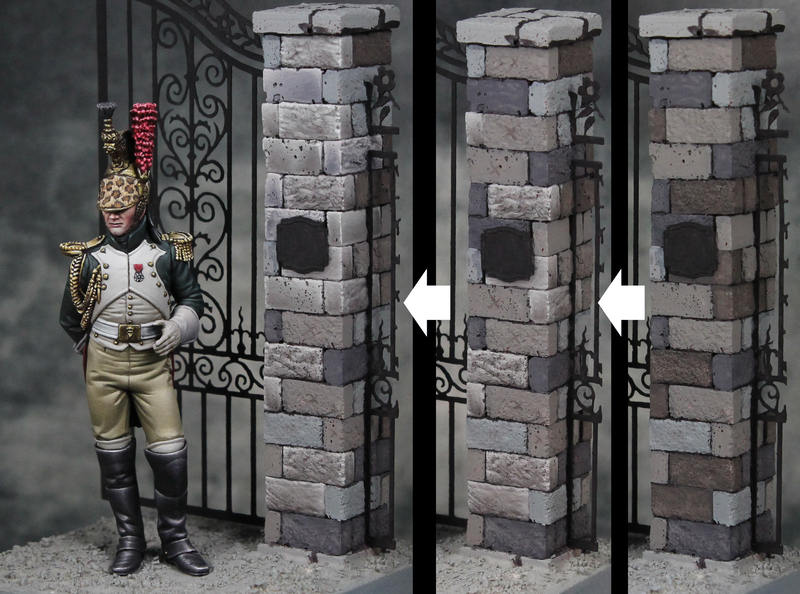 I began by base coating the column and the gate. The gate will be wrought iron and essentially look black in the end. The column will be stone however, I didn’t want it to be just one uniform colour. Stones coming in a variety of shades. So I picked out four different shades of grey to base the stones. I tried to mix the colours around and create a random look as best I could. From there I worked in small sections. I’d take 4 or 5 of the stones with the same base coat and the start to shade and highlight them. I suppose I could have done all the stones of the same color at once, but that would take a long time. Sticking with 4 or 5 let me finish them in one sitting. Some of the bricks had texture to the surface, so I tried to work with that when I could. For the smoother bricks I added a gradient to they wouldn’t be a uniform shade. In addition, I tried to have the highlights go around the top and sides of the bricks. You can see from the image on the right that this forms a nice edge highlight down the side of the column. 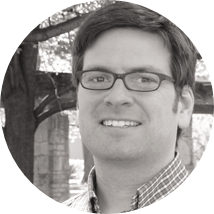 When the column was finally finished, I breathed a sigh of relief and moved on to the gate. 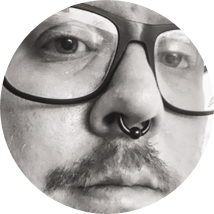 Although it looks mostly black in the images, it’s a broken up dark grey. I based it with Dark Elf Shadow. I then took a sponge (torn off piece of the padding that comes with the figures) and dipped in in mixes of Dark Elf Shadow and Dark Elf Skin (varying from dark to medium grey). I then gently dabbed it around the gate. I then applied some glazes and went in with the brush to adjust any sections that transitioned too abruptly. This helped to break up the otherwise flat surface of the gate. 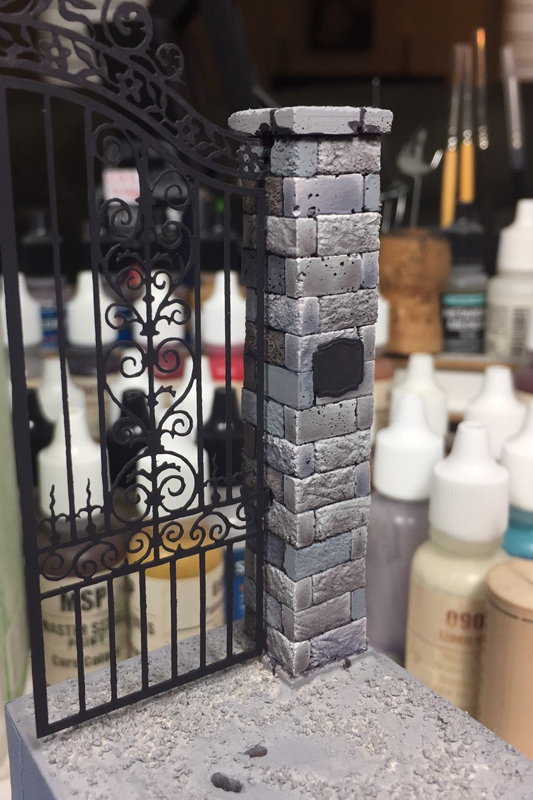 I also used mixes of Dark Elf Skin and Dark Elf Highlight to highlight the top surfaces of the gate. Unfortunately none of that shows up much in the finished photographs, but it is visible when you view the figure in person. 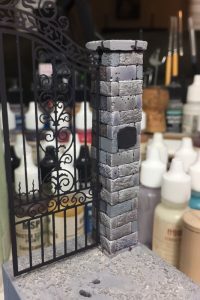 The final steps were applying some earth tones to the base and using some weathering pigments on the lower part of the column. I added some grass on the side and a few dead leaves while I was at it. Here is the completed scene. 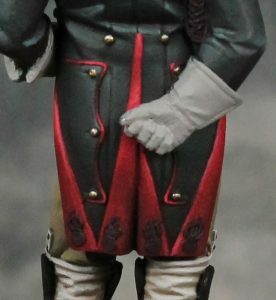 I thoroughly enjoyed working on this Napoleonic Dragoon and I am eager to begin the next figure of this era! Thanks for reading, remember you can like this post below or you can leave a comment!